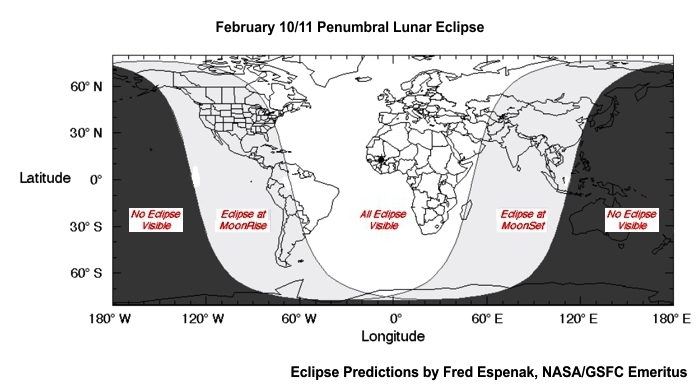 On the night of February 10/11 a penumbral lunar eclipse will be visible from most of North America. 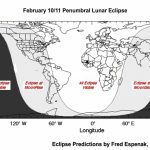 Penumbral eclipses of the Moon are never as spectacular as total eclipses, but this one is worth looking for because it’s a deep penumbral eclipse. I say “looking for” since many people wouldn’t notice the eclipse unless it was brought to their attention. 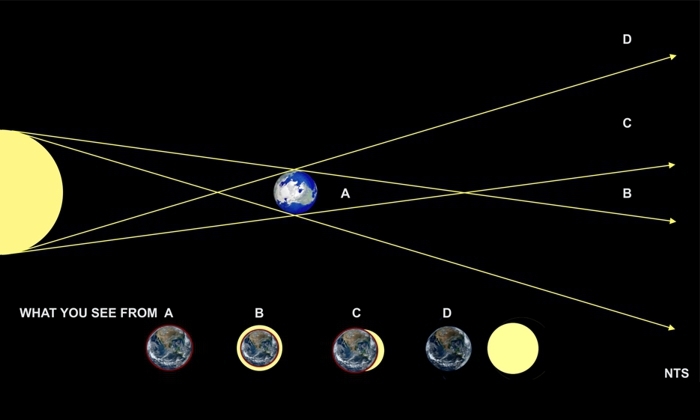 So before describing its appearance, let’s talk about the geometry of eclipses, and why eclipses happen. The slideshow above displays 4 graphics that will help you see the light. Images 1-3 are not to scale (NTS) to more clearly show the geometry. Image 1 shows rays of light drawn from the Sun toward the Earth. Those rays define regions in space from which the Earth totally blocks the Sun (A), appears too small to completely cover the Sun (B), partially blocks the Sun (C), and is seen side-by-side with the Sun (D). If you know the size of the Sun and Earth, and the distance between them, all these regions can be “measured” using plane geometry. Image 2 shows how the same geometry creates shadows of Earth that project into space as conical volumes of reduced light — the level of darkness depends on how much of the Sun is blocked. Image 2 also shows how much the geometry is not-to-scale. Note that the rays forming the umbra appear to converge about 3 Earth-diameters out in space. In reality, the vertex angle is a mere 0.5° (not the shown 25°). 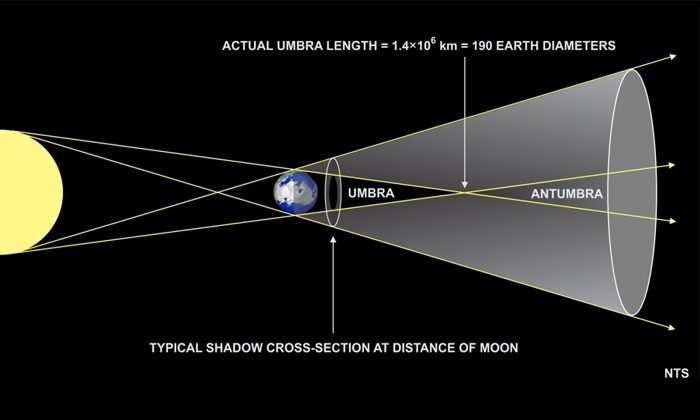 The umbra actually extends some 190 Earth-diameters in length. Image 3 shows why the Moon appears orange in color during an umbral eclipse (not what will happen on Feb 11). Rayleigh Scattering of sunlight as it passes through the Earth’s atmosphere filters out the shorter wavelengths (violet, blue, green, yellow) and allows the orange and red to continue on their way. Note also that the sunlight refracts twice — once upon entering the atmosphere and again upon leaving it. This bends the rays toward the Moon, which would otherwise appear totally dark in Earth’s shadow. 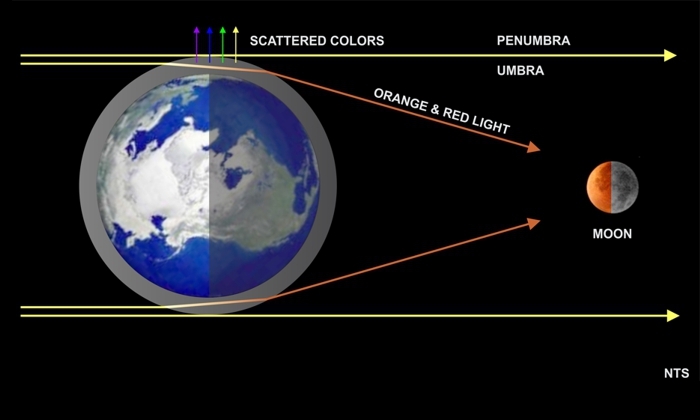 Image 3 also explains why, in Image 1, you would see a ring of orange light around the Earth from positions A, B, and C.
Image 4 shows what you can expect to see — a slight darkening of the northeast edge of the Moon, and maybe a hint of orange coloring. But that’s only if you’re on the lucky side of the planet. Click on the thumbnail below for a map of eclipse visibility. 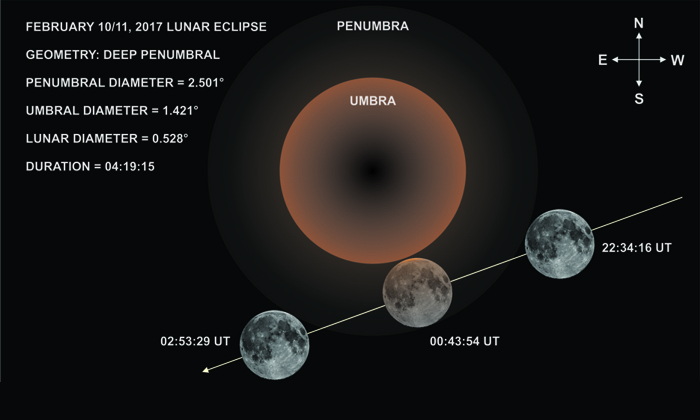 A penumbral lunar eclipse looks, at best, like a “wrong” phase of the Moon. See my Nov 27, 2004 post for a photographic comparison showing what I mean by “wrong.” But watching an eclipse with an understanding of how the Moon interacts with Earth’s shadows can be an illuminating experience.